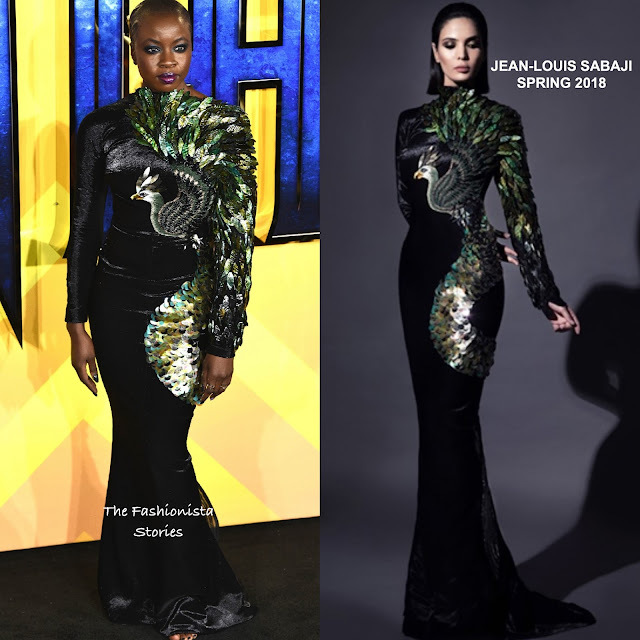 Continuing on the promo tour, Danai Gurira attended the premiere of Disney and Marvel's 'Black Panther' at the Hammersmith Apollo theater yesterday evening(February 8th) in London. The actress was a standout in a JEAN-LOUIS SABAJI SPRING 2018 black long sleeve floor length gown with a peacock embellished detail. I don't think anyone can pull this off as well as Danai. This is a bold choice that was perfect to make a show stopping entrance at the premiere. Also I love her flawless beauty look which topped off her look along with ARA VARTANIAN earrings and LOUBOUTIN sandals.